Smart steps for designing a stunning and functional garden path - Homestead Gardens, Inc. | Homestead Gardens, Inc.
Garden pathways blend function and beauty. They can be practical, but add a sense of whimsy while enhancing the outdoor design aesthetic. 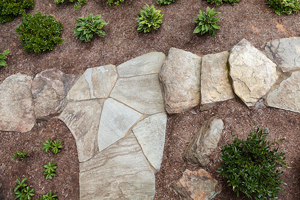 Is it time you add one to your landscape? Whether it’s a quaint pathway that leads to a meditation garden or a sturdy path that brings frequent walkers to the shoreline, be sure to keep a few steps in mind to create the best path for your needs. Decide if this is a task you’re taking on yourself or hiring out. A garden path may seem like an easy project, until you begin to figure out the labor involved in moving and installing hardscape supplies. When in doubt, get a consultation with an expert at Homestead Gardens Landscape Division and weigh your options. Sketch out your design and lay out your plan. When you work with the professionals at Homestead Gardens Landscape Division, you’ll get a custom design for your property based on your input, lifestyle, site conditions and budget. Create a timeline based on availability and shipping of supplies as well as installation. Keep in mind, weather delays and other hurdles can occur, so provide some wiggle room if you’re trying to install your path before a particular date. If you’re working with a contractor, you’ll just need to let them know your deadline so you can schedule appropriately. Then sit back and watch the magic happen! Once complete, the designer will set up a time to walk through the job to be sure everything was done to your satisfaction. Your pathway is in and you’re good to go, right? Sort of. Just like any element of a high-quality yard, you’ll need to do necessary maintenance from time to time. Whether that’s power spraying the brick in the spring or refreshing tired seams between pavers, stay ahead on maintenance and you’ll have a pathway to enjoy for decades to come.